Background: The CYP2D6 enzyme is involved in the metabolism of numerous psychopharmacological drugs. Guidelines recommend how to adjust the dose of medication based on the CYP2D6 genotype. Aims: To evaluate the effect of dose adjustment to the CYP2D6 genotype and phenotype, in patients with severe mental illness (SMI) already receiving psychopharmacological treatment. Methods: A total of 269 psychiatric patients (on the island Curaçao) receiving antipsychotic treatment were genotyped for CYP2D6. Of these, 45 patients were included for dose adjustment according to the clinical guideline of the Royal Dutch Association for the Advancement of Pharmacy, i.e., 17 CYP2D6 poor metabolizers, 26 intermediate metabolizers, and 2 ultrarapid metabolizers. These 45 patients were matched for age, gender, and type of medication with a control group of 41 patients who were CYP2D6 extensive metabolizers (i.e., with a normal CYP2D6 function). At baseline and at 4 months after dose adjustment, subjective experience, psychopathology, extrapyramidal side-effects, quality of life, and global functioning were assessed in these two groups. Results: At baseline, there were no differences between the groups regarding the prescribed dosage of antipsychotics, the number of side-effects, psychiatric symptoms, global functioning, or quality of life. After dose adjustment, no significant improvement in these parameters was reported. 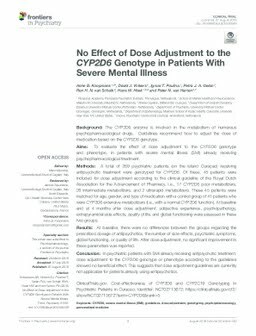 Conclusion: In psychiatric patients with SMI already receiving antipsychotic treatment, dose adjustment to the CYP2D6 genotype or phenotype according to the guidelines showed no beneficial effect. This suggests that dose adjustment guidelines are currently not applicable for patients already using antipsychotics.